Barcelona is one of the world’s best-loved city break destinations, and it’s easy to see why when the city is so packed with historical, cultural and culinary highlights. We’ve found some of the best things to do whilst you’re in the city, including a few things that are off the tourists’ beaten track. This spectacular church has an ancient history, with a church named Santa Maria Del Mar standing on the site as early as the seventh century. The cornerstone of the present building was laid on 25 March 1329, making the imposing temple all the more awe-inspiring as transporting the stones and creating the building was all done by hand. The soaring Gothic temple is lit by vivid stained glass windows and supported by impossibly thin stone columns. Much of the structure is original, although some damage was done during various political and military conflicts. It’s incredibly beautiful, a feat of engineering, and well worth a visit. The Gothic quarter is amazing, even if all you do is sit on the edge of a fountain and drink in some of the best Gothic architecture in the world. Every street is steeped in history, from the Jewish quarter to the secluded medieval alleyways that run through the neighbourhood. It is also home to some of the city’s best shopping, with handmade espadrilles making the perfect souvenirs, as well as the perfect photo opportunity as they hang floor-to-ceiling in every colour imaginable. If you’re looking for real treasure, get up early one Sunday and explore the Mercat Gotic, where you can discover wonderful antiques and, if you’re lucky, witness the traditional Catalan dance, Sardana, on the plaça. Located in the National Palace of Montjuic, the National Museum of Art of Catalonia was built for the International Exhibition of 1929. It is home to a stunning collection of Baroque and Renaissance masterpieces, one of the most exhaustive Romanesque collections in the world, world-class Modern art, and much more. Some of the exhibitions change regularly, so be sure to visit the website and see what exciting new work is on display here. One of the wonderful things about Barcelona is its close proximity to the beach, meaning you can escape from the scorching days of city life to cool off with a dip in the sea. Barceloneta, the city’s famed seaside district, is one of the best places to visit if you want a day of fun and frolic by the side of the ocean during your city break. The beaches here have an amazing atmosphere from all of the exciting activities that go on in the area. Locals hang out here, and the crashing of waves is almost drowned out by the thrum of music, laughter and fun happening all around. Kite fliers, street vendors, and shirtless rollerbladers weave their way amongst the hubbub, and the local restaurants entice people to their tables with the delicious scent of Catalan seafood. The perfect relaxed day, for when your feet need to recover from all that sightseeing. Some say the best views of Barcelona can be found at Park Güell, but they obviously haven’t hiked their way up the ancient road to Carretera de les Aigües. The road winds through the mountains, taking you away from the dazzling noise of the city into a sea of green tranquillity. It encompasses over 20 kilometres of relatively flat pedestrian walkways and bike paths, and once you reach the top you’ll be rewarded with the most jaw-dropping views of the city and the Mediterranean. It is the perfect escape from the city, and the cool breeze and swaying grass lit by the bright sunlight will have you feeling rejuvenated in no time. Several film festivals have popped up in Barcelona in recent years, and the gorgeous weather makes it the perfect place to enjoy a movie outdoors on a warm night. If you know where to look, there are quite a few free offerings, such as the Cinema Lliure, which shows independent films on the beach every Thursday and Sunday evening throughout July and August. There really is nothing like relaxing on the beach, drink in hand, and enjoying the mystical atmosphere of a wonderful film as the waves lap the beach after dark. Possibly the most famous food market in the world, La Boqueria attracts more than 45,000 visitors every day. Don’t let the crowds put you off though, because this seemingly endless sprawl of stalls contains some of the best food you’ll eat during your trip to Barcelona. Brightly coloured stalls spill along the streets with a cornucopia of the region’s finest cheeses, charcuterie, seafood, and fresh fruit and veg. Although some parts of the market have changed to meet the demands of tourists, you can still find a slice of the old market if you know where to look. Head to Pinotxo, where the 75-year-old owner has been creating traditional dishes, such as chickpeas with black pudding and baby squid with white beans since long before the hordes of tourists arrived. Awarded two Michelin stars, as well as being named The Best Restaurant 2011 in Catalonia, ABaC is no normal hotel restaurant. Led by Chef Jordi Cruz, the kitchen team have created innovative cuisine that showcases local produce, reinvention with a respect for tradition. Choose from two set menus, with optional wine pairing, to taste some of the gastronomic gems served in this beautiful restaurant. Favourite dishes include the smoked steak tartare and the stunning Mediterranean tuna belly. Not just a restaurant, but a real culinary experience. Started by Albert Adrias, one of Barcelona’s most successful restauranteurs, Pakta specialises in Peruvian-Japanese fusion dishes that will bring your sense to life. The best option to get a proper taste of this exquisite fusion of flavours is to order one of the set menus, which includes an array of dishes to be sampled, all of which must be eaten in a specific order. Tender, melt-in-your-mouth sashimi is one of the stand outs, which is served with fragrant, expertly-flavoured sushi rice. The restaurant has recently won its first Michelin star, and after you’ve dined here you won’t be surprised at the award. Be sure to book well in advance, although the length of the line is a testament to the quality of the food. 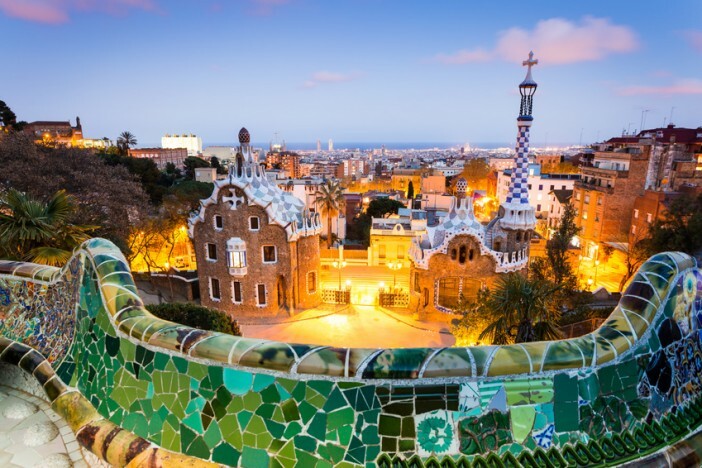 If this guide has got your pulse racing for a trip to this vibrant city, why not see which of our fantastic cruises could take you to Barcelona? Browse our range of Mediterranean cruises or call or friendly team on 1300 857 345.